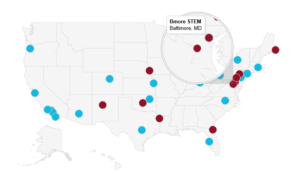 BALTIMORE–Computer science education is more effective when programs coordinate on the best teaching and funding strategies, so the STEM Funders Network on Thursday added 10 new communities to its nationwide coalition aimed at integrating learning opportunities for millions of students. The group’s national Community of Practice ecosystem is now in 37 communities and aims to build cross-collaborative learning platforms in 100 cities by 2020. The 10 new communities joining the collaboration between public and private sector groups are based in Baltimore; Schnecksville, Pennsylvania; Albuquerque, New Mexico; Oklahoma City; Washington; Jacksonville, Florida; Lancaster, Pennsylvania; Shreveport, Louisiana; Omaha, Nebraska; and Machias, Maine. Continue Reading.